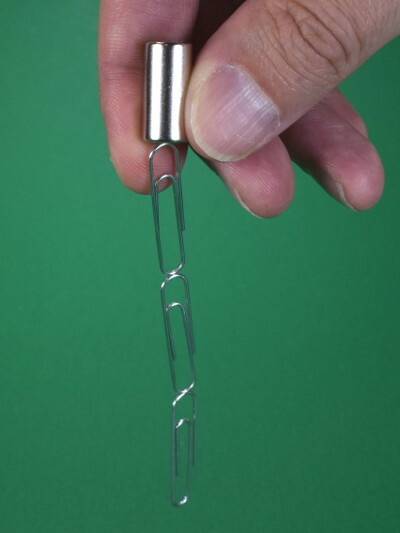 On one hand, a string of steel paperclips clearly extends the attraction of a magnet. A paperclip stuck to a magnet temporarily becomes a magnet itself. The last paperclip in a line of them wouldn’t attract to the magnet from that far away without the other paperclips strung in a row. 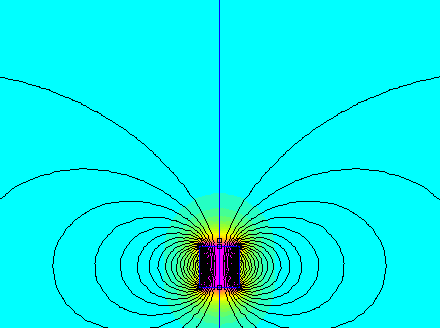 The useful magnetic field is definitely extended farther away from the magnet. A small cylinder magnet stuck to a steel disc sticks to a steel sheet-metal surface, but just barely. On the other hand, steel is said to shield, redirect or block magnetic fields. A magnet stuck to a steel washer won’t stick nearly as well to a steel surface. The steel washer blocks the field from reaching it, and reduces the pull force. When we’re asked about this kind of thing, our answer is often a frustratingly vague, “It depends.” In this article, we’ll dig down and try to find some more specific answers to this kind of question. When you stick a magnet to a piece of iron or steel, the steel temporarily acts like a magnet. We can say that it has a north and a south pole, just like the other magnets we sell. We call the piece of steel a “temporary magnet,” because this effect goes away when we remove the magnet. That's why neodymium magnets are called, "permanent magnets." The magnetization is permanent, and doesn't require an external magnet or magnetic field to keep it going. Let’s cut to the heart of the matter: If you have a particular setup, how can you know if a piece of steel is going to improve performance or reduce it? When our engineers say that the answer depends on the details, they’re really talking about the geometry. What’s the size and shape of the magnet? What’s the size and shape of the steel? How are they arranged relative to one another? What are they sticking to? What’s their purpose – are you more interested in pull force to some object or field strength to trip a sensor? To try and answer this question, let’s set aside our paperclips and consider a more general scenario. 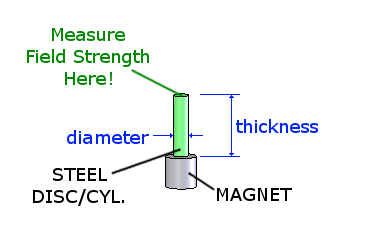 Start with a simple cylinder magnet like the ¼” diameter x ¼” thick D44 magnet. Next, stick a steel disc/cylinder on top of the magnet with a diameter and thickness that we can specify. We can choose those two dimensions to consider a tall cylinder or a thin disc, or anything in between. How do the dimensions vary the field strength or pull force we see at the end of that piece of steel? How do these results compare with what we would see without the steel part present? The selectors below let you try out different sizes of that steel cylinder sitting on top of the magnet. It allows you to estimate either field strength at the end of the steel part, or pull force to a steel surface. ...above a steel cylinder with varying diameter and thickness, stuck to a magnet. The size of the steel disc/cylinder varies with the inputs. If Diameter-None is selected, there's no steel disc/cylinder. 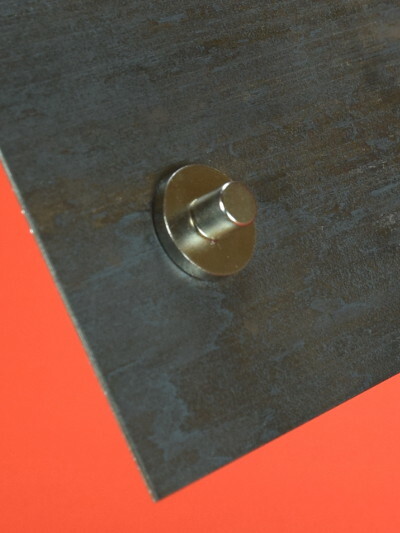 The magnet is always a 1/4" diameter x 1/4" thick D44 cylinder magnet. That’s really fun to play with, but let’s get back to the original question: If I have a piece of steel on top of this magnet, does it increase or decrease field strength? Let’s start with a baseline that we can compare our results to. Our baseline is the situation with no steel part at all. 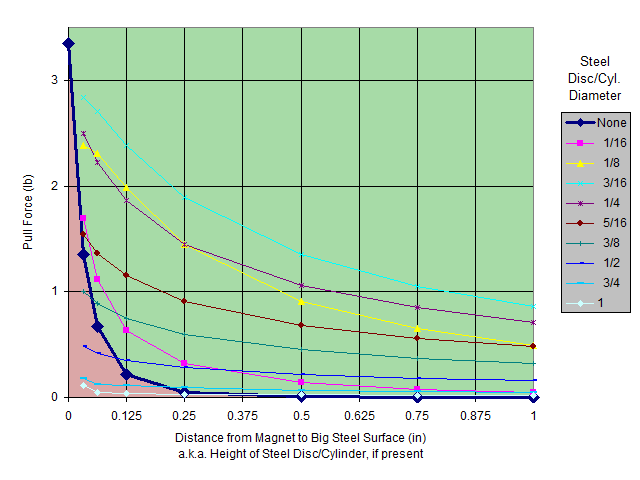 You can select that by picking the diameter as, “None.” These no-steel results are the same as a single magnet in free space, described in our Surface Fields article. 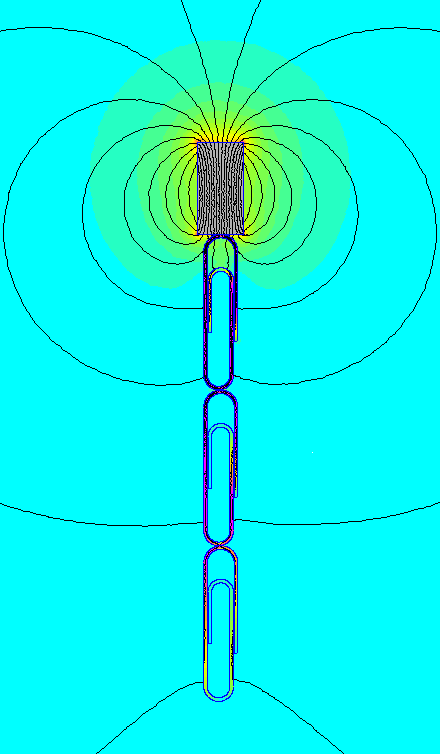 We're just measuring the field strength at various distances away from the surface of a magnet. The field strength is strong near the surface of the magnet and drops quickly as you move farther and farther away. In the graph below, we’ve plotted out these baseline values as the thicker, dark blue line. The results are the same as the selector tool above, just plotted out in a graph. Now, what happens if instead of empty space between the magnet and our measurement point, we stick a ¼” diameter steel disc or rod on top of the magnet? How might the measurement compare with the steel in place, instead of an air gap? We find different answers depending on the height of the 1/4" diameter steel piece. If the height of the steel cylinder is 1/8” or less, the field strength is weaker. The steel reduces the field strength at our measurement point. We’d be better off just leaving an air gap. If the height is ¼” or greater, we expect a stronger field strength. The steel stretches or extends the strong field farther away from the magnet. In the graph, the green background denotes where using the steel part increases field strength, compared to having no steel part at all. The red background shows where it is decreased. At the end of all this study, we’ve circled back to the original answer– the result depends on the geometry! Even More Complicated -- Pull Force is Different! Field strength is not the same thing as pull force. While these numbers seem to be loosely related, there’s no one-to-one comparison between the two. They are very different measures of a magnet’s performance. In the graph below, we show the same series of results but in terms of pull force to a big steel plate, rather than field strength. While the shape is similar, the results are different. Not every steel shape that was weaker in the earlier field strength analysis is weaker for pull force. Some shapes can provide stronger pull force but weaker field strength. In other cases, the opposite is true. In our study of field strength, the smaller diameter discs or cylinders provided more field strength than larger diameters. With Pull Force, it isn't so simple. If you look at diameters from small to large, you find a weaker pull force that increases to a maximum with 3/16" diameter steel, and then decreases again. It's awful complicated! 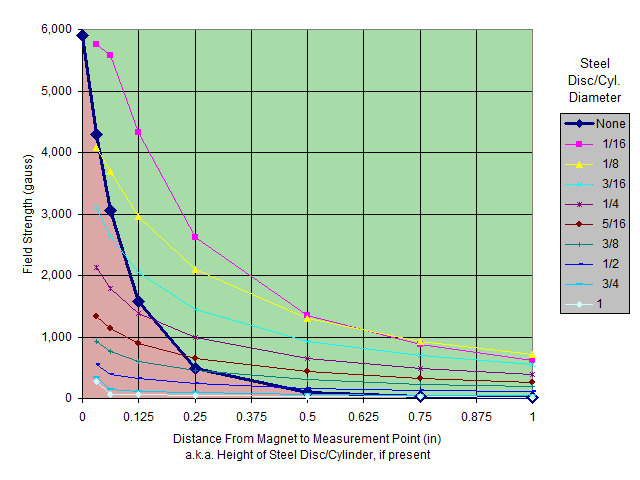 Not only does the performance of magnet depend on the shape of the magnet and any surrounding steel objects, it also depends on what measure of performance is important to you.